Have you heard the term “negative evidence” and wondered what that meant in your genealogy research? Is this the same as negative results when searching a database? This question comes up often with those working through the Research Like a Pro process, so let’s take a look at those two negatives and figure out what the difference is and how to effectively use them in our genealogy. It’s inevitable. We’re going to do a search in an online database, microfilm, or book and not find our person of interest. What do we do next? Do we jump to another record collection or do we take the time to enter that negative search into our research log? If we don’t keep track of our negative searches, we are doomed to repeat the search, perhaps many times. By tracking negative search results, we can determine where our ancestors didn’t live, marry, or die. We can change our hypothesis and research in a new location. Negative searches have great value to our research, but only if we use them correctly. To use negative searches purposefully, try these three things. 1. Enter the search into your research log. Note the search parameters, the date searched, and any other pertinent information. Did the search reveal other people of the same surname, just not your individual? Or was there no person of that surname at all in the database. 2. Create a source citation for the negative search that could be put in your research report. For example: “Maryland Records, Somerset Parish, Somerset County, 1650-1825,” negative search for Ballard’s between 1666 and 1866, Family History Library microfilm 441,446 item 2. 3. Evaluate your hypothesis after you’ve done all the searches on your research plan. If the findings were negative, perhaps the family never lived in the area after a certain date. Perhaps the negative results of the searches will lead you to a conclusion using negative evidence. Contrasting with a negative search result, negative evidence comes from our analysis of the research question as a whole. To illustrate, let’s look at the case of the Ballard family of Somerset County, Maryland. The original settler in this county was Charles Ballard (1640-1682). Charles and his wife Sarah had several children who all stayed in the county and had children. 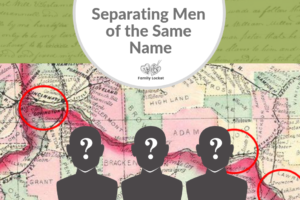 Like so many of our ancestors, the Ballard descendants named their children after each other and there are multiple men named Charles, Henry, Jarvis, John, and Arnold. Not to be outdone, the women are named Sarah, Elizabeth, Ann, and Eleanor. How could tax lists help? 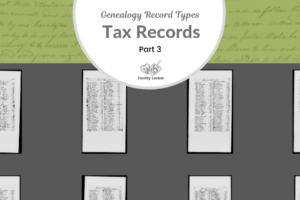 Each entry gave the name of the individual being taxed, whether the head of the household or dependent, the location in the county, and the names of enslaved individuals in the household. Doing some research, I discovered the poll tax was levied on free males over the age of fifteen and slaves of both sexes over fifteen. When a young man reached the age of fifteen, he would be included in the tax for that household. Following a household, I could estimate ages of the males based on when they appeared on the tax list as a dependent. The inclusion of the names of the enslaved people in a household was very useful in clarifying who was who. In my research log, I detailed the results for each year of all Ballard households so I could then analyze the findings. The first extant tax list is from 1723, and lists a Charles Ballard of Wicomico as the head of household. Charles dictated his will in 1724 and died about 1725. His widow, Eleanor shows up in the tax lists in 1728 and is present every year in Wicomico – every year until 1737 when she is noticeably absent. I concluded that Eleanor had died by 1737, based on her absence on the tax list. Compare the entries and see if you come to the same conclusion. 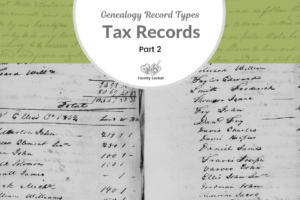 In genealogy, we always have to seek for additional clues to solidify our findings, so I could next search for land records or probate for Eleanor. She didn’t leave a will, but there could be other probate records for her and her absence on the 1737 tax list gives me an excellent starting date for probate research. To summarize, if I had done a simple search for Eleanor in the 1737 tax list of Somerset County, Maryland, I would have recorded a negative result in my research log. I could have added notes that a Charles Ballard was still listed in Wicomoco and created a source citation for the negative search. Viewing the tax lists as a whole and analyzing the data I gathered from her husband’s will of 1724, I used Eleanor’s absence on the 1737 tax list as negative evidence that she had died by that date. Negative findings and evidence are a key part of our genealogy research and deserve our attention! Best of luck in all of your genealogy adventures. (1) Somerset County Court, Tax Lists, 1723-1759 C1812, Maryland State Archives, ( http://guide.msa.maryland.gov/pages/series.aspx?id=C1812 : accessed 19 November 2018).